Blackburn missed out on the play-offs, despite beating Premier League hopefuls Wigan to finish their league season unbeaten in 12 matches. Tom Cairney gave Rovers an early lead before Ivan Ramis levelled for Wigan. Rudy Gestede put the hosts back in front and his header extended the lead before half-time. Jordan Rhodes scored 25 goals for Blackburn in the Championship to finish as the club's top scorer this season. The Scotland international actually scored more three more in the league last season, two of which while at Huddersfield, when he finished with 28. Rhodes' most prolific campaign was at Huddersfield, where he scored 36 in 40 appearances in 2011-12 in League One. James McClean pulled a goal back for Wigan, before Jordan Rhodes and Nicky Maynard netted late goals. Wigan had already sealed a place in the Championship play-offs, despite losing five of their last seven matches in all competitions. They will play QPR at home in the first leg on 9 May. Blackburn knew reaching the play-offs was going to be a difficult task, needing and to lose, while beating Wigan and then turning around a seven-goal swing on the Royals. By half-time, with Reading and Brighton losing, Ewood Park was full of belief the unlikely could become possible with their side 3-1 ahead and just four goals adrift of the Royals. Blackburn got the start they needed as Cairney, voted supporters' player of the year, weaved through three Wigan defenders before slotting in the opener from just inside the penalty area. Wigan were level soon after when Ramis bundled the ball over the line with his head after Martyn Waghorn's corner was flicked onto the bar by Rob Kiernan. Parity wasn't restored for long when Gestede, who signed permanently from Cardiff in January after an initial loan, scored his fifth goal in three games, drilling low into the bottom corner, before the striker headed home Craig Conway's cross. The second-half turned out to be an anti-climax though as an improved Wigan frustrated the hosts, before killing Rovers' hopes with McClean's close-range strike. Gestede was denied a second hat-trick in three games by the crossbar and, with Reading drawing and Brighton winning, they finished in eighth, two points adrift of the top six, despite Rhodes' late header. Maynard's impressive finish from the edge of the penalty area was not enough for Wigan, who will be hoping to earn an instant Premier League return. 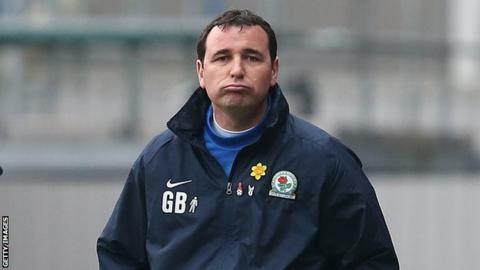 Blackburn manager Gary Bowyer: "The objective was to win the game and we did that. I thought we played ever so well. "From where we were last year, when we could still have gone down on the last day of the season, we can't look at this as anything but progress. We have to build on that now. "I'm already looking forward to next season but there is going to be a lot of work ahead. This club needs another three windows before the squad is back where it should be." Wigan manager Uwe Rosler: "It was the perfect opportunity to give players more minutes, and give others a rest. "Blackburn Rovers are probably disappointed they are not where they should be but congratulations to the manager for a team of young players with good momentum. "We have a decent momentum going in and I know we can compete with QPR. The game will not be lost or won in the first leg." Match ends, Blackburn Rovers 4, Wigan Athletic 3. Second Half ends, Blackburn Rovers 4, Wigan Athletic 3. Attempt missed. Rudy Gestede (Blackburn Rovers) right footed shot from the centre of the box is too high. Assisted by Liam Feeney. Attempt missed. James McClean (Wigan Athletic) left footed shot from the centre of the box is just a bit too high. Assisted by Shaun Maloney following a set piece situation. Stephen Crainey (Wigan Athletic) wins a free kick on the right wing. Corner, Wigan Athletic. Conceded by Paul Robinson. Attempt saved. Shaun Maloney (Wigan Athletic) header from the centre of the box is saved in the top right corner. Assisted by James McClean with a cross. Joshua McEachran (Wigan Athletic) wins a free kick in the defensive half. Goal! Blackburn Rovers 4, Wigan Athletic 3. Nicky Maynard (Wigan Athletic) right footed shot from outside the box to the bottom left corner. Assisted by Jack Collison. Matthew Kilgallon (Blackburn Rovers) is shown the yellow card for a bad foul. Corner, Blackburn Rovers. Conceded by Leon Barnett. Goal! Blackburn Rovers 4, Wigan Athletic 2. Jordan Rhodes (Blackburn Rovers) header from very close range to the centre of the goal. Assisted by Craig Conway with a cross following a set piece situation. Attempt saved. Jordan Rhodes (Blackburn Rovers) right footed shot from the centre of the box is saved in the bottom left corner. Assisted by Tom Cairney. Attempt saved. Matthew Kilgallon (Blackburn Rovers) right footed shot from the centre of the box is saved in the bottom left corner. Assisted by Craig Conway with a cross. Stephen Crainey (Wigan Athletic) is shown the yellow card for a bad foul. Attempt blocked. Shaun Maloney (Wigan Athletic) right footed shot from outside the box is blocked. Assisted by Joshua McEachran. Attempt missed. Robert Kiernan (Wigan Athletic) header from the centre of the box misses to the right. Assisted by James McClean with a cross following a corner. Corner, Wigan Athletic. Conceded by Grant Hanley. Corner, Blackburn Rovers. Conceded by Scott Carson. Attempt saved. Tom Cairney (Blackburn Rovers) left footed shot from outside the box is saved in the top right corner. Assisted by Michael Keane. Substitution, Blackburn Rovers. Jason Lowe replaces Corry Evans. Attempt missed. Jordan Rhodes (Blackburn Rovers) header from the centre of the box is close, but misses to the right. Assisted by Joshua King with a cross. Substitution, Wigan Athletic. Markus Holgersson replaces Gary Caldwell. Foul by Jack Collison (Wigan Athletic). Attempt missed. Robert Kiernan (Wigan Athletic) left footed shot from outside the box is too high. Rudy Gestede (Blackburn Rovers) is shown the yellow card for a bad foul.